Junior Jorge Leon hit two free throws with four seconds left on the clock to lift the Beatty High School boys basketball team to a dramatic come-from-behind 63-62 victory over Spring Mountain on Jan. 16 in the Class 1A Southern League opener. Richard Stephens/Special to the Pahrump Valley Times Beatty senior Jacob Henry scored 23 points as the Hornets defeated Spring Mountain for the first time since 2011. Senior Jacob Henry scored 23 points as Beatty rallied from a 49-41 deficit after three quarters. The final minute was a wild one as the Hornets pulled out a win over the Golden Eagles for the first time since 2011. The Hornets trailed 61-59 but had fouls to give before finally getting Spring Mountain to the line, where they hit the first and missed the second. Henry got the rebound and kicked it out to Leon, who found Fabian Perez sprinting up the court. Perez worked the baseline and passed to Brayden Lynn. Lynn missed a shot, but Geo Maldonado was there for the putback to pull the Hornets within one. This time the Golden Eagles (8-9, 2-1 Class 1A Southern) missed the front end of the one-and-one after a foul. This time the Hornets missed two shots, but Leon rebounded the second one and was fouled on the putback attempt with four seconds to go. Leon hit both free throws, and the Golden Eagles came up short on a last-second shot. “It was a great final minute of basketball and a great moment for Hornet basketball,” Sullivan said. Leon finished with 13 points, Perez scored 12 and Maldonado finished with 10. Two days later, Beatty shot just 6 for 39 from the floor in a 65-35 loss to Pahranagat Valley in Alamo. Sullivan said the Hornets were sluggish on defense and didn’t move the ball well on offense against the Panthers (9-10, 4-1 1A Southern), and noted a lack of communication and an inability to make shifts they needed to make. Perez scored 10 points for the Hornets, who surrendered 25 points during the second quarter and trailed 38-18 at the half. 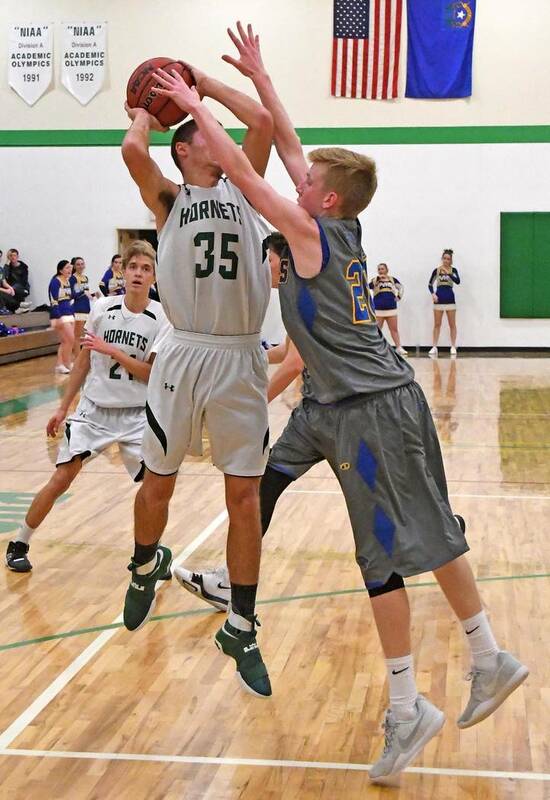 The Hornets got back on track at home Jan. 22 against Indian Springs, outscoring the Thunderbirds 13-0 during the third quarter and rolling to a 55-38 win. Alan Sandoval led the way with 12 points, with Perez netting 8 and Henry and Maldonado each finishing with 7. Three days later the Hornets were back on the road, traveling to Littlefield, Arizona, to take on Beaver Dam. Despite averaging only 41 points per game, the Diamondbacks (6-6, 2-2 1A Southern) got back to .500 with a 59-40 win. The game left the Hornets at 4-4 on the season, including 2-2 in the Southern League.